Parenting in Pain... A true story. | The House of Martins The House of Martins: Parenting in Pain... A true story. Parenting in Pain... A true story. It's been a while since I've done a Motherhood Monday post. It's been a busy time in our house and I'm finding less and less time to think and put the time into a post the way that Motherhood Monday deserves. But this topic I need to talk about. I don't know how many of you also suffer from migraines - but it's not pretty. And it's really not pretty when you are trying to parent. I've had migraines since puberty. When I was pregnant with Lucille - they went away completely. When I was pregnant with Gus - they got 1000% times worse. And that intensity never went away. I get migraines 2-3 times a week. Most of the time they go away with Ibuprofen or my prescription medication - but last weekend about 3/4 of the way through a day date to see Hamilton in SF with the hubby - I got one. And I wasn't feeling much better until Tuesday night. Meaning it last 2 days and 5 hours, roughly. During those 2 days and 5 hours, I still had work to get done, a house to take care of and kids to watch and play with. But I had lost the ability to form cohesive sentences, I couldn't look at a computer or phone screen for longer than 30 seconds without it making everything worse and every little bang, scream, whine - was like fingers on a chalkboard. Luckily for me, I had help from my husband and parents - but it still wasn't until Tuesday night that I actually just stopped everything -- and went and laid down. Something I probably should have done earlier. There was yelling that probably shouldn't have happened. And tears that probably shouldn't have happened. And extra T.V. time for the kids which probably shouldn't have happened either. But it made me realize a few things. I need to identify my triggers. I need to track what I am doing, where I am and what I ate prior to and during the start of a migraine. I have an appointment to get my eyes checked - to make sure eye strain isn't a contributing factor. I should always carry my migraine medication and be ready to take it. This one is hard for me - because I'd really like to just figure out how to not have them at all (by figuring out my triggers) but in the meantime - I don't want to suffer. I've been feeling the symptoms on and off still between last Tuesday and today - but I'm trying to be more proactive and aware of triggers. My birthday was on Thursday and my husband even bought me Butterbur and some Magnesium drink mix as part of a present. haha. The life of a migraine mom. This article on Scary Mommy sums it up. If you know a mom with migraines - read it. And be ready to understand what they are going through and how you can help. 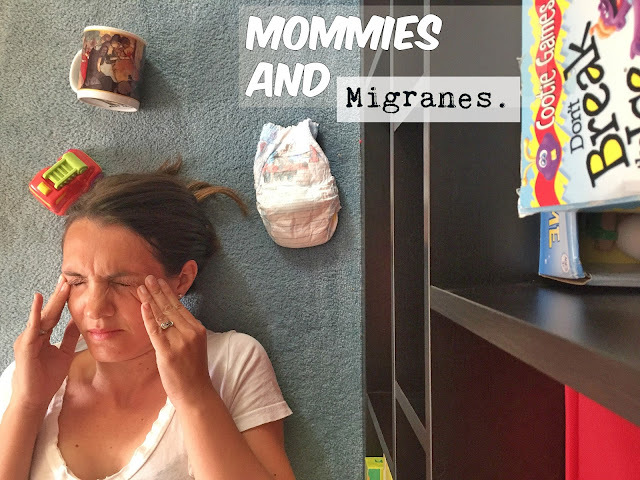 If you're a mom with migraines - you aren't alone - I feel your pain. Literally.